specializes in designing custom stationery and is now offering a complete stationery package combined with professional design and quality printing. Nothing makes a business look more credible than professionally designed stationery. 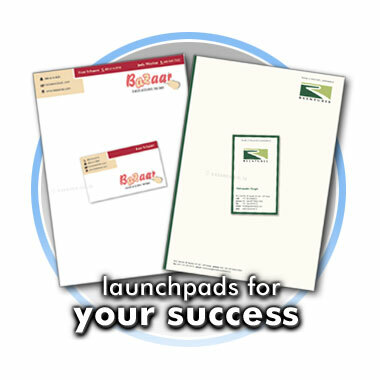 Stationery acts as an ambassador for the business since it reaches to the hands of both existing and prospect clients. It is not just a piece of paper, stationery leaves a very profound impact and thus stationery design should reflect the objective of your business. At Essence Design Studio we understand how to apply the colors and fonts of your logo to your business cards, letterhead and envelopes in order to create an image your customers will remember. Stationery designing is not something everyone can do. It needs proper graphic design sense, quality stationery designing and an expert eye for colors and images. There are a lot of companies that offer stationary designing at low costs too. But it is imperative that by going for a cheap package you don't go for cheap or low quality stationery designing as it can harm your reputation tremendously. Your design will be uniquely created to contain your company theme, logo, and colours. Just like our logo design process, you'll receive multiple design concepts created by different designers and be able to revise those designs to your liking. We realize the importance of stationery and thus create stationery design which is both aesthetic and logical. Essence Design Studio has helped thousands of customers get business stationery they love. Just try us, we guarantee our work. Still unsure? Spend some time in our stationery gallery to see examples of stationery design or read what our customers have to say about their experience and we think you'll be convinced. Essence offers an unbeatable value for stationery design. We provide proofs via the Internet. The stationery concepts will be viewable on a private page located within our web site or will be sent by e-mail. Essence takes pride in utilizing the latest innovations in the printing industry. Our stationery is printed on quality paper using the highest degree of film processing giving your design the crisp quality it needs to have. Worried about how your stationery will reach you? At Essence Design Studio we use Blue Dart courier service to deliver our final products to anywhere in the World. Your printed stationery can now be delivered to your doorstep within a couple of days.